Samsung’s original Gear Fit was as flawed as it was ambitious, but the market for fitness gadgets is still growing. Of course Samsung was going to try again! 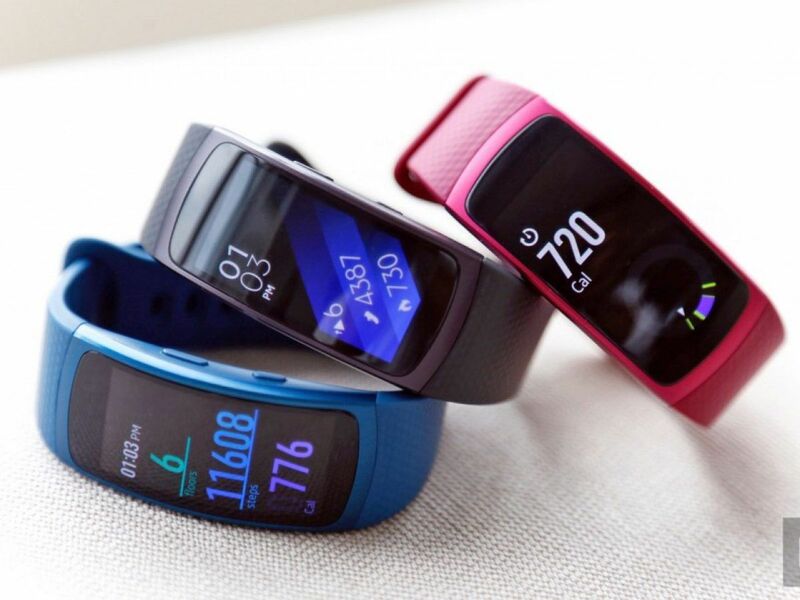 That’s where the new $179 Gear Fit 2 comes in: Samsung took the fitness formula it developed two years ago, polished it up a bit and added a few features that have become de rigueur for higher-end workout wearables. You’ll be able to pre-order one starting June 3rd, but join us here for a first look. First, the broad strokes. The Gear Fit 2 is nearly the same size as the model that came out two years ago; it’s just a little longer and a little wider to accommodate the updated display. That would be the 1.5-inch curved AMOLED screen, which is almost twice as wide as the original to better display your stats. An added bonus of this tweaked design is that the Gear Fit 2 is so, so much more comfortable to wear than its predecessor. Seriously, it’s a night-and-day difference — no small thing on a device you’re supposed to wear 24/7. There’s a heart-rate sensor here too, just like last time, and even in my brief time testing it, the readout seemed a bit more accurate than before. Throw in a dual-core 1GHz Exynos 3250 chipset, 512MB of RAM and a 200mAh battery (rated for three or four days of mixed use) and you have got the foundation for potentially great device. Meanwhile, the addition of GPS and the ability to automatically recognize and track certain exercises help the Tizen-powered wristband go toe to toe with rivals like the Fitbit Blaze. For those who need some tunes to get them through runs, there’s 4GB of storage inside the band, allowing you to stream saved music to your Bluetooth headphones. Curiously, Samsung inked a deal with Spotify to provide playlists and music curated by athletes because… why not? And if you’re the sort who brags, you can easily share tracked runs to Facebook. 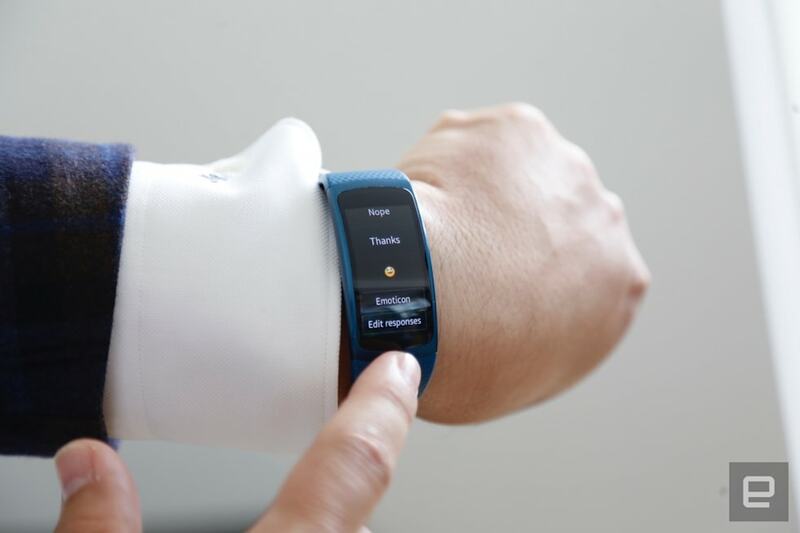 Sharing, as it turns out, is a big part of the new Gear Fit experience. Friends and phones contacts who use Samsung’s S Health platform can issue challenges to each other and keep tabs on their progress. Then there are the plain usability updates. If you ever used the original Gear Fit, you’ll surely remember that sometimes information was displayed vertically on your wrist, and sometimes horizontally. No more of that: The UI is strictly vertical this time around, and while that doesn’t sound like a huge change, it goes a long way in making the Gear Fit 2 feel more refined. Indeed, refinement is the overarching theme here. Samsung had high hopes for the original Gear Fit but didn’t (or couldn’t) build a device that adequately ticked off all the boxes they laid out. After making wearableslike the Gear S2, the company is better prepared to build high-quality Tizen devices. If we’re lucky, that experience will make the Gear Fit 2 more than just a pretty bauble when it launches on June 10th.